In the York 7 expedition, Secrets of the Salt Marsh, students will explore Maine’s salt marshes through the lens of 16 species from four parts of the food web. Our major learning targets are: 1) I can explain how salt marsh organisms interact with their living and nonliving environment to obtain matter and energy, and 2) I can explain why we should care about the salt marsh. We will travel to Scarborough Marsh for onsite explorations and meet with community experts for each species group. Students will use art, poetry, informational writing, and trophic classification to create and organize digital iBooks which will be offered to the Scarborough Marsh Nature Center for distribution to summer visitors and southern Maine marsh enthusiasts. In Seeds of Culture, York 7 students will examine the relationships among geography, food and culture. Our kickoff will take place in and around Portland, as small groups of students visit area ethnic restaurants and sample native foods. Each student will conduct an in-depth investigation of a country, and then create a character from this country that will be part of a sequel that we will write to the book Seedfolks, our anchor text. Students will then bring their characters to life in a series of monologues, to be performed in December. We will also be working with the Cultivating Community project in Portland, and work on our own garden at King Middle School. York 6 will be paying special attention to the upcoming presidential and state elections as part of their Rock the Vote expedition. Not only will they be learning about the candidates and issues, they are hoping to teach the school about them, as well. Our students will work in committees to plan a schoolwide mock election, in conjunction with the nationwide Student Mock Election. Part of their charge is to inform the school about the candidates and the issues of the day. In their classes, they will be learning about the electoral process, civic responsibilities, local and national issues and candidates, media coverage, persuasive techniques, and number crunching, as major pieces of this expedition. Students will be visiting Republican and Democratic headquarters and will listen to a speaker from the Green Independent party. Students will also participate in a voter registration drive, setting up tables throughout the city to register new voters! Students will also study the election results at King and compare them to the national and state results, and prepare graphs that showcase the comparisons. Our results will be on display during parent conferences. We are planning to host an election night, inviting any and all King families to watch the returns come in. We’re excited to be part of an informed citizenry right here at King! York 6 students are plunging into a new expedition this spring. We will be diving into the world of watershed sustainability by trawling for ways we and our community can keep things that are out of sight, in mind. Service learning opportunities will provide students with real action for change, and our unique insight into possible improvements to or solutions to current issues pertaining to Casco Bay health will grow. Partners from the City of Portland, Portland Water District, and YardScaping will guide us in considering how individuals in Portland can improve their impact on the Bay. We’ll be collecting data at Back Cove, traveling to the Audubon Society to see what watershed protection means outside of urban areas, and planning team service projects. Our culminating event will showcase student brochures which will encourage sustainable actions by the citizens of King Middle School and Portland. The York 7 community will research specific events of social reform that were a part of larger movements during the 60’s and 70’s, from equal rights movements to movements to protect the environment. Students will analyze histories that led to these events and how these movements affect their lives today. Students will decide for themselves what is worth fighting for and the steps that they can take to create change. 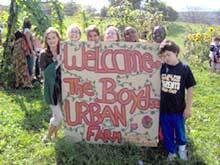 In Seeds of Culture, York 6 students will examine the relationships among geography, food and culture. Our kickoff will take place in and around Portland, as small groups of students visit area ethnic restaurants and sample native foods. Each student will conduct an in-depth investigation of a country, and then create a character from this country that will be part of a sequel that we will write to the book Seedfolks, our anchor text. Students will then bring their characters to life in a performance that they will put on at Portland Stage Company in May. We will also be working with the Cultivating Community project in Portland, and work on our own garden at King Middle School. Our first expedition, The Faces of King, will teach the Expeditionary Learning model. While experiencing the parts of an expedition, students will meet the many people who create the culture at King. We will examine the rights and responsibilities of a King student, as well as of a citizen of Maine and the United States. Students will explore the demographics of our population here at King, and in science they will study the interdepence of systems, applying that to the inner workings of King. Our students will create brochures that will be distributed to new students and visitors to our building. In our culminating event, parents will participate in the “fastest expedition ever”, an interactive student-led presentation designed to teach our parents how we learn here at King. No, it's not an expedition about science fiction. Rather, the students and teachers of York 7 are joining forces with the City of Portland and the Maine Volunteer Lake Monitoring Program to address Maine's invasive species epidemic. Along the way, we will be collecting data on invasives in Maine, working to reduce invasives in Portland and at Biddeford Pool, and disseminating our findings through the design and production of a 21st century newspaper (front page only). How do individuals make contributions to society that are larger than themselves? What are the processes that people utilize to become positive change agents in their lives and the communities in which they live? Gandhi said, "Be the change you want to see in the world." The students of York 7 will be engaged in making this imperative a reality. Using Revans' model of Action Learning developed for adults in professional settings, students will work in Action Teams to explore issues of justice and equity, develop resources for increasing public knowledge of these issues, and act for change based upon models of civic action. Our final product will naturally be the change created within and by the Action Teams. In the process each students will create a reflective journal and document each of the steps they used in the process of changing their world. At our Culminating Event in December, students will present the results of their action for change in the context of persuading the audience to continue this work beyond the expedition. In Seeds of Culture, students will examine the influence and effects of food on a culture. We will explore celebrations and customs around food, as well as follow the journey of a seed to each particular food. Our kick off will take place in and around Portland, as small groups of students visit area ethnic restaurants and sample native foods. One of our goals, also, is to work with the Cultivating Community project in Portland, and bring a garden to King Middle School. Finally, we are planning to create our own restaurant for a night, here at King. York 6 will be paying special attention to the upcoming presidential and state elections as part of their Rock the Vote expedition. Not only will they be learning about the candidates and issues, they are hoping to teach the school about them, as well. Our students will work in committees to plan a schoolwide mock election, in conjunction with the nationwide Studentwide Mock Election. Part of their charge is to inform the school about the candidates and the issues of the day. In their classes, they will be learning about the electoral process, civic responsibilities, local and national issues and candidates, media coverage, persuasive techniques, and number crunching, as major pieces of this expedition. Students will be visiting Republican and Democratic headquarters, as well as going to City Hall to meet with the mayor and an election official. On a different day, the students will participate in a voter registration drive, setting up tables throughout the city and trying to register new voters! Students will also study the election results at King and compare them to the national and state results, and prepare graphs that showcase the comparisons. Our results will be on display during parent conferences. We are planning to host an election night, inviting any and all King families to watch the returns come in. We’re excited to be part of an informed citizenry right here at King! York 7 is exploring the American immigrant experience in Making It Home. Working with local immigrants -- from former King students to community elders in Portland -- our students will get a close up and personal perspective on the immigrant experience. The expedition will culminate in a series of monologues written and performed by the York 7 students. As part of Talking Trash, students are building gardens at King with Cultivating Community. Throughout the year, students have partnered with this organization in Bayside neighborhoods and at their offices on Elm Street in Portland. Recently, a group of students helped at Cultivating Community to make salve, a healing lotion that is sold as a fundraiser. See the movie. 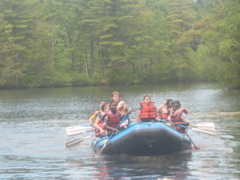 As a service project connected to Talking Trash, the students of York 7 spent a day on the Presumpscot River, rafting and cleaning up trash along the way. The students of York 6 kickoffed our expedition by visiting three local sites of environmental interest. We began our day at EcoMaine -- a processing center for recycling and burning trash. Next, we went to Riverside Recycling Facility. People bring large items to Riverside. Some items might be hazardous, some are too large for regular garbage disposal. Finally, we went to the East End Community School to see a green school. During the mini-expedition Talking Trash, York 6 students will examine how students, staff and faculty produce and dispose of waste here at King. After analyzing the trash--yes, we're going through the garbage--students will explore the feasibility of recycling and reusing to reduce the waste that King produces. The students will share the results of their research by crafting persuasive products that promote environmentally friendly alternatives. In addition, through grants from and collaboration with the Portland Trails and Cultivating Community Garden personnel, York 6 students are involved in a two-year project to design, create and maintain both an organic garden and a composting site at King. Join us for the latest information and to leave comments about Talking Trash at our Blog. We are looking forward to a brand-new expedition that we are calling Seeds of Culture, which will examine the influence and effects of food on a culture. We will explore celebrations and customs around food, as well as follow the journey of a seed to each particular food. Our kick-off will take place in and around Portland, as small groups of students visit area ethnic restaurants and sample native foods. One of our goals, also, is to work with the Cultivating Community project in Portland, and bring a garden to King Middle School. Finally, we are planning to create our own restaurant for a night, here at King.